A typical Cushman Eagle. This one has been highly customized with the addition of after market chrome etc. Image downloaded from the Internet and is used under the principle of creative commons. Though clouds were gathering on the horizon that would eventually break into a storm that forever changed the culture of that time, our way of life during that day was stable and not threatened by very much at all. The famed Jimmy Wilson crime had occurred right in the midst of us in July of the very summer of 1957 yet most children my age probably knew nothing at all about it. Generally speaking, as a population, we were living good, we were loving life, and we were having fun. “Fun” – for a boy – then, was not very complicated; especially if one owned what almost any self respecting teenage boy of that time would have considered to be the ultimate possession. 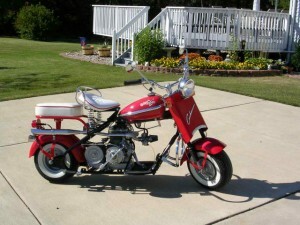 A Cushman Eagle Motorcycle. Though some people may differ with me and hold out that a Cushman Eagle is properly called a “motor scooter” I beg to differ. In my mind the chief defining characteristic that sets a motorcycle apart from a motor scooter is the fact that one mounts a motorcycle much like one mounts a horse. That is, you throw your leg up and over the seat of a motorcycle just as you would the saddle of a horse. It happens that that is exactly how one has to mount a Cushman Eagle. Therefore, to me, it is a motorcycle. A motor scooter is not so much mounted as it is stepped through and set upon; somewhat like getting onto a girls bicycle. Trust me, these differences, subtle that they may be, are important things in the mind of a thirteen year old boy. A Cushman Eagle Motorcycle was the thing to own during the summer of 1957. The pride of ownership of the three individuals that actually owned a Cushman Eagle in our town was especially evident. They constituted a much admired and looked up to fraternity of fourteen and fifteen year old teenage boys that one would see zipping around all over town; usually with a pretty teenage girl holding the lucky rider tightly around the waist while sitting astride the luggage carrier which was just behind the genuine “saddle seat” – unlike the cushion bench seat on a mere motor scooter. Lynn Warren, Rusty Harrell, and Rudy Harrison were the proud possessors of the much coveted type of motorcycle under discussion here. Notice that my name is not among them. Oh how envious I was! I wanted one of those things so bad I could practically taste it. A few things stood in my way though: I wasn’t going to be fourteen until September, I didn’t have money to buy one, I had, in my view, a somewhat over protective mother, and finally, though I had learned to broad-slide a car pretty good on one of my father’s dirt race tracks while growing up from the age of six to the ripe old age of thirteen, I had never piloted a motorized two wheel conveyance of any kind whatsoever. I made a plan that went something like this: If I could just live from the late spring – early summer of 1957 until September I would be fourteen so that problem would be solved. As far as the lack of money problem was concerned I had a paper route that paid a little something. If I could manage to improve my subscription collection rate for nearly all of my customers that would help out too. Never mind that sometimes they didn’t get their paper at all, or of the ones that did, the most of them ended up in the grass that was still wet from the morning dew or, if not that at least in the shrubbery. The over protective mother thing: whine and plead. And finally, that not knowing how to ride thing . . . hum, let me think . . . hum, well come to think of it, maybe I didn’t have a complete plan. 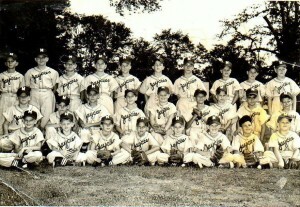 Rusty Harrell is the fourth from the right in the middle row. In the back row Lynn Warren is the fourth from the left and Rudy Harrison is the third from the right. This picture was probably taken a year or two before the events described in the story took place. You can click on the picture to enlarge it. Fate, that ever present partner in all things human came to my rescue. At that time of the year Little League Baseball was in full swing, a practice session was in progress on a corner of the football field right on the very northeast corner of the MI campus near the intersection of Wilkerson Drive and Washington Street, and Rusty Harrell was there with his Cushman – Eagle – Motorcycle! Opportunity had knocked. That troubling not knowing how to ride issue was about to be solved. This would also help out with the over protective mother problem. I am sure she would have, in her side of the sure-to-be argument, put forth a statement like: “why Wesley, you don’t even know how to ride a motorcycle and here you are wanting to buy one” – something like that. With just a little stretch of the truth of my soon-to-be riding experience I could easily put that kind of reasoning aside. Though nowadays I like to think that I would have had knowledge enough on that bygone day to have secured a ride upon the beast by employing some skillful degree of wheedling with Rusty, the truth is that I just begged and begged until he couldn’t stand it anymore, gave up, and let me take my place upon the monster. All eight horsepower of it. There I sat. He had left it running and in neutral for me – or so I assumed. I say, there I sat with my feet flat upon the ground, the thing was vibrating my very soul while rumbling and growling just as loud as can be – maybe even loud enough to cover up the sound of my rapidly pounding heart. I was so excited I could hardly breathe. Rusty was shouting a few instructions to me; pointing out the gear positions for the tank mounted shift lever, operation of the foot-pedal clutch which was on the left side of the machine, where the brakes were located and how to apply them, how to slowly apply power by rolling the handlebar throttle grip toward me – slowly, there was something about some sort of combination clutch arrangement having to do with a centrifugal clutch and a foot clutch – some mention that you didn’t have to use the clutch to get started, that it would start moving from a dead stop etc. etc. Rusty finished speaking. I had hardly heard a word he said, and whatever I did hear I assure you I certainly didn’t understand any of it – especially about that newfangled **clutch thingy. I barely, slowly, rolled the throttle toward me. The next thing I knew my feet were snatched off the ground so far that if my elbows had not gotten in the way of my kneecaps on their way up I would surely have somersaulted backwards off the thing, and to make a bad start worse, I was headed straight for an entire team of little league baseball players as fast as the thing would go – at least go in first gear – which it had been in all along. Which by the way is pretty dang fast I tell you. The speed I was going had me pushed back so far that my arms were stretched out as far as they could go – which also means I was holding the throttle wide open. I couldn’t roll it forward – and I couldn’t let go either. Now there’s a catch 22 if there ever was one. Somehow the thing must have gotten a mind of its own about what direction it wanted to go. With me hanging on for dear life it made a sashay through the infield (there were no casualties later reported) and then veered off and headed due north and up an incline directly towards Wilkerson Drive, a street with 6” tall concrete curbs on both sides I might add. Oh, let’s backup a second here and modify that word “incline” I used just now. Let’s use ramp, yeah, ramp’s a good word; as in Evel Knievel Motorcycle Jumping Ramp. So, up the incline, err ramp I flew and launched off into mid-air. Where or if I landed anywhere between the curb lines of Wilkerson Drive is unknown to me. If I did jump the entire street, thus clearing both 6” curbs whilst airborne, whether by accident or not, I’ll hold out that that’s a pretty good jump for an inexperienced thirteen year old rider, I don’t care what you see on Motocross TV shows now-a-days. Upon clearing Wilkerson Drive I found myself still thundering along at full throttle, going right across the well groomed and landscaped yard of the home of one of Marion’s, shall we say, “finer” citizens. The home was a rather stately structure I might add. I’ll also add that I was headed straight for it. Just before crashing through the front shrubbery, the front wall, and into the living room became a real possibility I managed to gain enough control to careen off to the left and travel a little way into the neighbor’s yard. It was only then that I managed to roll off the throttle and putter back toward Wilkerson Drive. I bumped down the curb on the north side of the road and wobbled to a stop hard up against the other curb on the ball-field side where Rusty and about half the population of Marion were waiting for me. I never rode another Cushman Eagle after that. Not that I would have ever had an opportunity to ride one that belonged to Rusty or anyone else in Marion mind you. In the end the motorcycle was undamaged and It probably didn’t take too long for nature to replace a few tiger lilies and the blossoms I knocked off the azalea bushes and a couple of crepe myrtles. After all this time I’m sure the small furrows I plowed through the yards have healed up too. I’ll close by saying that I probably never thanked Rusty, so in place of that I will here dedicate this short little story to him. A skinny, dark complected boy who has gone on now. One who once owned a Cushman Eagle Motorcycle. * MI is what the locals of that time called Marion Military Institute. The full abbreviation is of course MMI but we never called it that. **A Cushman Eagle of the model talked about here is equipped with a hybrid sort of clutch. It is one that disengages at idle speed and engages when the motor is revved up, therefore it can be left in gear and started rolling from a dead stop by the use of the throttle alone. The foot-pedal clutch part of the assembly is generally only used to shift up to second gear after one is well underway – though it can be used to “scratch off” from a dead stop in first gear. Wes, tears are rolling down my cheeks. I don’t remember this, but I was probably one of those little league’ers you plowed through. After all, I am in the picture… God stuff, buddy, really, really good!